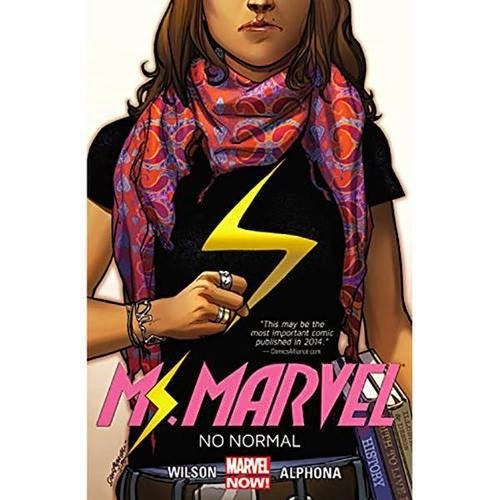 Ms. Marvel volume 1: No Normal by G. Willow Wilson and Adrian Alphona, published by Marvel Comics. Marvel Comics made headlines when they announced last year. that a new series would be debuting with a young, female Muslim as the lead character. First: a female-led superhero book? A rarity. But second: a Muslim character in the lead? Unheard of in the superhero genre. This was a big deal, and (unless you were one of the many close-minded, vociferous, “fans” of the medium online) something for which Marvel deserved recognition. 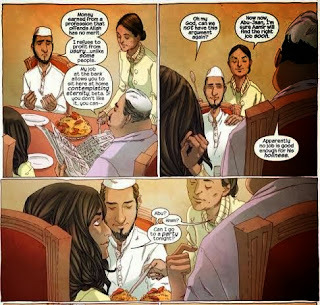 Shepherded by editor Steve Wacker, it was definitely more important for this book to be really good, right out of the gate, than the typical superhero launch – not just in terms of the genre of superheroes, but also in terms of how the Muslim characters were handled. Marvel signed G. Willow Wilson, author of prose and comics who also happens to be female and Muslim, to write the series, while artist Adrian Alphona, co-creator of the Runaways with Brian K. Vaughan, to do the art. This was an extremely intelligent first step. But, the book still needed to be good. Well, it is. 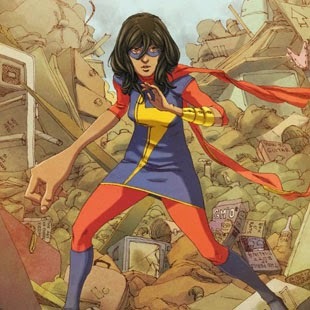 The first volume of the new Ms. Marvel introduces Kamala Khan, a sixteen-year-old girl living and going to high school in Jersey City. With an older brother, focused on his religious studies, and parents who are devout Muslims that only wish to protect their children from the loose mores of America, Kamala finds herself in an endless struggle to please her parents while also wishing to fit in and experience life as a teenager with her friends and classmates. This internal struggle, above all else, is what defines this new series, and it works wonderfully. While personally interested in the specificity of this family and their Muslim traditions, all of which feels natural and genuine in a manner unreached in other books with similar scenarios, it was the universality of these relationships that I admired most. Teenagers are always in conflict with their parents, in one degree or another, and, despite the distinct background of Kamala, I can easily imagine teenagers and other readers being able to relate to her “civilian” story. And, in that way, this series hearkens back to Marvel’s signature hero, Spider-Man, in its dichotomy between the hero and the person. Which is not to say there isn’t drama or action in this series. There is. 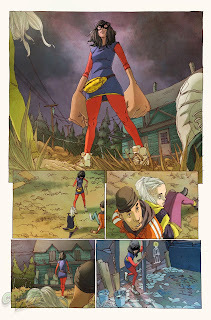 Kamala, overcome by a strange fog as she wanders away from her classmates’ party, discovers she now has shape-shifting abilities – she can grow to twice her size, increase the girth of her fist, change how she looks, shrink down to the size of a cockroach – and she is freaked out. But, in the meantime, one of her classmates, drunk and trying to fight off her boyfriend, falls into the lake. 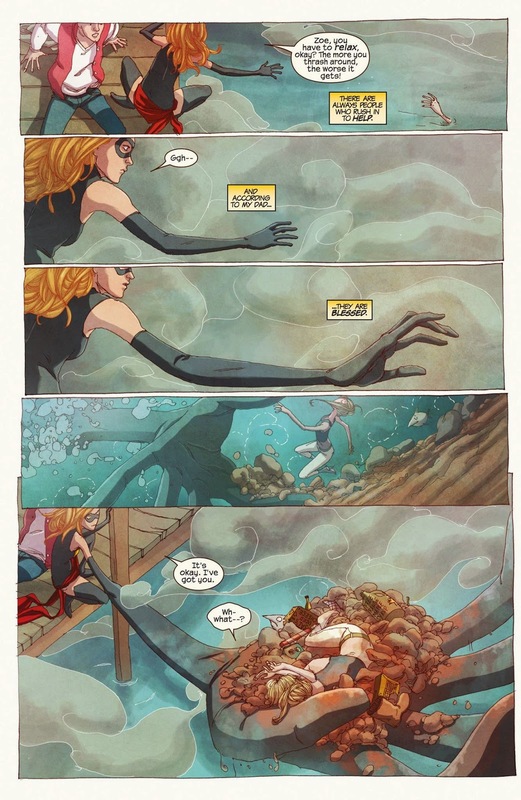 Kamala, in the form of the original, blond Ms. Marvel, pulls her from the water and saves her life. 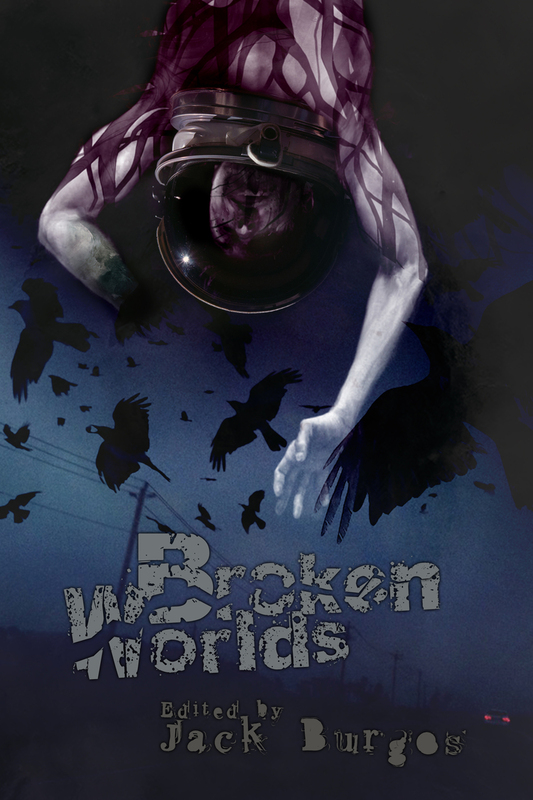 But she must run off before changing back to herself – because she hasn’t yet fully digested what has happened to her, nor is she yet able to control her powers. 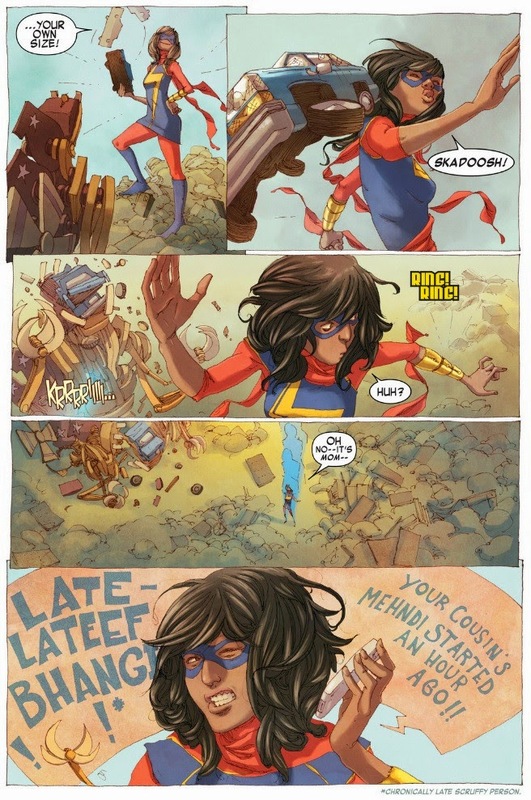 And, once she returns home, sneaking back in her bedroom window, Kamala is discovered by her parents and grounded. It even feels like something out of an old Spider-Man comic! From here, Kamala must learn how to control her powers while she decides what to do with them. She quickly comes to the idea that she must use her abilities to help people in their neighborhood. Which spurs her to try and stop a robbery at the local quickie mart, the Circle Q, where her best friend, Bruno, works. This does not end well for Kamala, as a gunshot rings out on the final page of that particular issue – that page, and those leading up to it, are a master class of dramatic writing, building tension, sidestepping the danger, only to have it rear its head in a way that is both surprising and inevitable, truly impressive work there. The way Wilson writes Kamala out of this corner is equally impressive, and from here we watch as she learns not only to accept her own identity as a hero (eventually switching from morphing into the idealized, blond iteration of Ms. Marvel to helping others as herself, but with a costume more in line with a typical teenage girl), but also learns how to be a hero. It’s like fusing on Bruce Wayne’s education in “Year One” with the previously mentioned Spider-Man foundation, and it works incredibly well. Wilson infuses the stories with humor and drama, creating stories that engage and entertain in equal measure. This is one of the best new superhero books I’ve read in a long time. 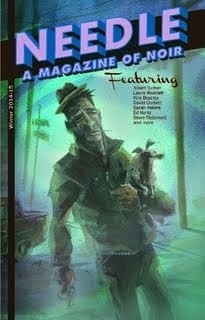 And equal billing must go to the artist, Adrian Alphona. 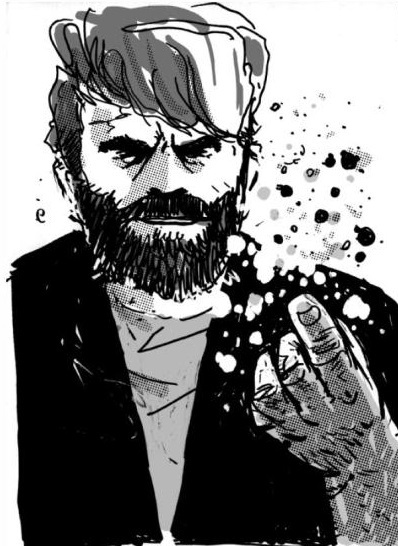 His art feels like it would be more comfortable in a Top Shelf book rather than a Marvel book, but it works well with the story being told by Wilson. 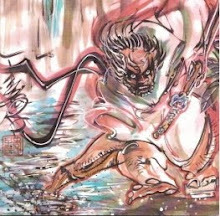 Cartoony without feeling slapstick, he grafts a manga-esque feel onto the art without turning toward the expected tropes of that medium. There are moments where figures have more cartoonish faces, dependent upon the scene, and there is a flow and ease to the body language that is commendable. 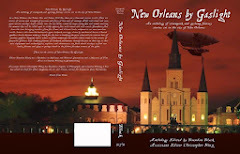 Nothing feels stiff under Alphona’s pen, and it heightens the truthfulness of the story, lending a naturalness to the images that, I feel, allows readers to better relate to the story. 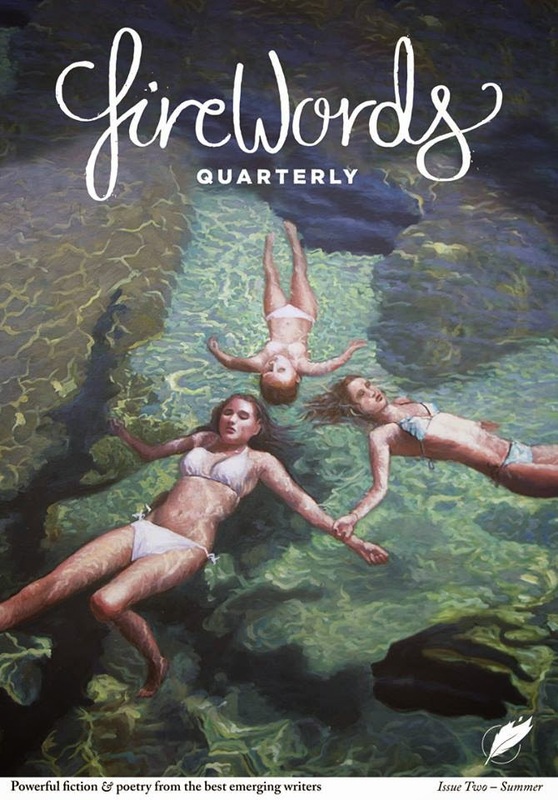 Sometimes, when an artist has a very rigid, very precise style, it can be off-putting, a glaring reminder that what you’re reading is a proximity of what’s outside your world, but a far more strict representation, which, for me, can pull me right out of the narrative. Alphona hits just the right balance, infusing the action scenes with energy and dynamism, while offsetting “civilian” scenes with a laid back feeling. 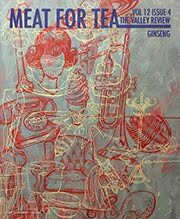 And, just for bonus points, there are numerous jokes hidden in the background – on cereal boxes (GM-Os) or store signs or book covers – that only add to the enjoyment of this book. If you haven’t already, you should definitely read Ms. Marvel: No Normal. It’s fun and full of drama – a classic comic book series told with a contemporary sensibility – and it is well worth your time.